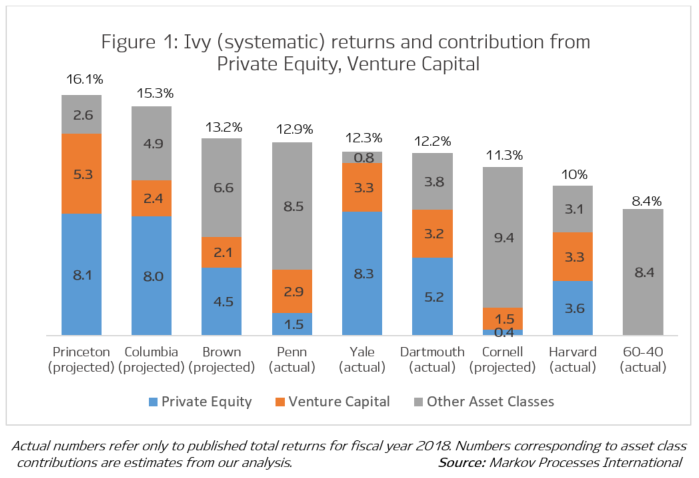 With half of Ivy League endowments (Dartmouth, Penn, Harvard and Yale) having reported their fiscal year 2018 returns, it looks like the Ivies are going to have another strong year, as they did in fiscal year 2017. Our early projections indicate that private equity and venture capital appear to be driving the bulk of returns (see Figure 1). 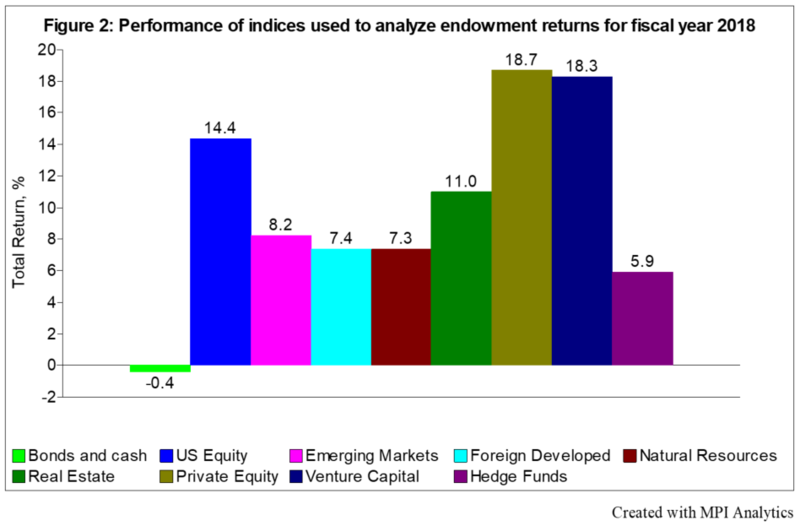 To gain early insight into 2018 performance, we ran an analysis of the Ivies using published annual performance data and indices that correspond to the asset classes commonly disclosed in annual endowment reports (see Figure 2). This enabled us to create factor-mimicking portfolios for each Ivy endowment using our patented Dynamic Style Analysis (DSA)1 model. For endowments that have already reported 2018 fiscal year returns, we used those portfolios to estimate how much return each asset class contributes. For the endowments that haven’t reported returns yet, we followed an approach that we used in our recent deep dive into the hidden risks of the endowment model. Using the factors and exposures obtained as of fiscal year 2017—and assuming that portfolio exposures did not change in fiscal year 2018—we estimated fiscal year 2018 performance by multiplying 2017 exposures by the factor returns in fiscal year 2018. As evident from Figure 1, and similar to fiscal year 2017, all Ivies—reported and non-reported—appear to produce returns that surpass the 60-40 portfolio. What is striking, however, is the portion of those returns that appears to be coming from exposure to private equity and venture capital, which have done particularly well in fiscal year 2018—returning 18.7 percent and 18.3 percent, respectively,3 vs. a 14.4 percent return for the S&P 500. With the remaining Ivy League endowments expected to report in the coming days, we will be following returns closely to see how well DSA predicts fiscal year 2018 performance and identify which endowments achieve superior returns to the market indices we have chosen, something we would expect given their emphasis on active management. 1DISCLAIMER: MPI conducts performance-based analyses and, beyond any public information, does not claim to know or insinuate what the actual strategy, positions or holdings of the funds or companies discussed are, nor are we commenting on the quality or merits of the strategies. This analysis is purely returns-based and does not reflect actual holdings. Deviations between our analysis and the actual holdings and/or management decisions made by funds are expected and inherent in any quantitative analysis. MPI makes no warranties or guarantees as to the accuracy of this statistical analysis, nor does it take any responsibility for investment decisions made by any parties based on this analysis. 3Based on preliminary numbers from Cambridge Associates.